As farmland is not effectively utilized from economic or environmental perspectives, this study proposes an institutional system for coordinating farmland use in Japan, examining the role played by communities. We propose a theoretical and conceptual model to identify the conditions for successful farmland use coordination and classify the various types of farmland consolidation into four simplified models. We compare these models in terms of (1) change in profits from individual to collective farmland use for landowners and cultivators, (2) transaction costs for mobilizing farmland, (3) transaction costs associated with collective action, and (4) the possibility of coordinating the interests of community members. Econometric analysis indicates that the promotion of collective actions increases the likelihood of communities with a high level of social capital to coordinate farmland use, concentrate farmland in the hands of large-scale cultivators, and prevent the abandonment of farmland. Overall, the results of this study point to the importance of social capital accumulation in rural communities to achieve high degrees of land consolidation. This study proposes a system for the consolidation of farmland in Japan by examining the role played by rural communities in coordinating farmland use.1 The inefficient utilization of farmland is a major challenge for agriculture in Japan from both economic and environmental perspectives. Agriculture in Asia faces declining comparative advantage due to increasing wage rates in the process of economic development. Otsuka (2013) argues that Asian countries must expand farm size to reduce labor costs and maintain competitiveness in food production. It is important to improve the agricultural competitiveness of many Asian countries, like Japan, that suffer from low food self-sufficiency, and countries in which the agriculture is a key sector for economic growth. In addition, we stress that agriculture in Asia, particularly rice farming, is not only important as an economic activity, but it also contributes toward maintaining the multifunctionality of agriculture or providing agri-environmental public goods, such as preserving rural landscapes and preventing floods. We can view these multifunctional outputs2 as “joint products” associated with agricultural production that can have positive impacts on the environment and eventually, the well-being of the rural sector. The provision of these outputs is closely linked to agricultural production, in which the declining competitiveness of agriculture can hamper the provision of these outputs (OECD 2000). The under-utilization of farmland in Japan can be characterized by the fact that the average farm size is very small, with highly fragmented plots. The inefficiency in farmland use reduces farmland profitability and adds to the increase in abandoned farmland. Conversely, many previous studies have indicated the existence of economies of scale in Japanese rice farming. Hayami and Kawagoe (1989) demonstrate that economies of scale in rice farming emerged in the mid-1960s owing to medium-sized farm mechanization. Takahashi and Honma (2015) report that the economies of scale have been gradually increasing since the 1980s, by which time medium-sized farm mechanization was complete. More recently, the concentration of farmland into large-scale farms has accelerated, owing to the retirement of aged cultivators. According to the Agricultural Census, the share of farmland cultivated by farmers with holding sizes greater than 20 ha was 37.5% in 2015, 26.1% in 2005, and 32.7% in 2010. In addition, the fragmentation of farmland leads to economic inefficiency because of the increased time needed to move between fields and manage irrigation water. Estimating a stochastic frontier cost function, Kawasaki (2010) reveals that fragmentation increases production costs and offsets economies of scale. 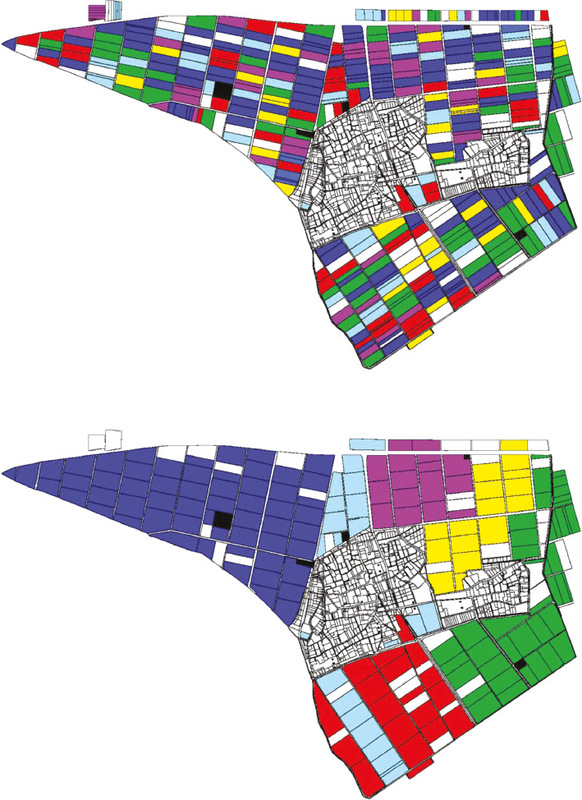 Unlike land concentration, plot fragmentation continues to be an issue because the newly available plots are often separated from other plots that are already under the management of the cultivator. According to a survey by the government in 2013, principal farmers (whose average farm size is 18.4 ha) cultivate 31.5 plots on average, on an average plot size of 0.59 ha. Furthermore, the lack of farmland consolidation leads to inefficiency in the provision of non-commodity outputs. Agriculture can jointly provide commodity outputs, such as rice, and non-commodity outputs, such as agri-environment and rural landscape. More specifically, as the OECD (2000), the source of the jointness between commodity and non-commodity provision in many cases lies in the use of farmland. In other words, farmers as the owners of private properties (i.e. farmland) provide non-commodity outputs with public goods characteristics through the use of farmland; for example, paddy fields maintained by a farmer through rice farming can provide flood protection capacity for downstream residents. Another example is landscape preservation through farming, which is an essential component of a rural society. Previous studies argue that collective action is required to improve the quality of these non-commodity outputs, mainly because their provision indicates economies of scale and, sometimes, economies of scope as well (e.g. Latacz-Lohmann 1998; Hodge and McNally 2000; Hodge 2001; Davis et al. 2004). They also indicate that organizing collective action will lead to high transaction costs. In this case, farmland consolidation can lead to multifunctionality efficiency gains through the adoption of appropriate farming methods with lower transaction costs than the case in which there are a number of small-scale farmers. For example, if, owing to farmland consolidation, farm management in a village comprises of a single farmer who can make decisions based on his or her judgment, then the farmer’s changing farming practices can improve the entire village landscape. Another example is that farm management of consolidated land managed by a single farmer is more capable of increasing the flood prevention capacity of the farmland only with the effort of the farmer in lowering the water levels of the fields prior to heavy rainfall. In addition, Shobayashi, Kinoshita, and Takeda (2010) state that the consolidation of farmland helps reduce the amount of water required for irrigation because a single farmer can utilize drained water from upstream parcels. These examples indicate that land consolidation can substantially reduce the transaction costs associated with organizing collective action to improve the quality and quantity of multifunctional outputs. Then, the question is why the progress in farmland consolidation has been slow despite these long-recognized inefficiencies. The recent literature on farmland consolidation in Japan focuses on transaction costs related to achieving farmland consolidation. Such transaction costs arise through the processes of negotiation, measurement, and enforcement. For example, expectations of farmland conversion for non-agricultural use also give rise to transaction costs. In Japan, the price of farmland for non-agricultural use is much higher than that for agricultural use. Farmers with small-sized farms are unwilling to lease out farmland because they are afraid that the expected capital gain from conversion may fall. Ishida and Kiminami (1987), in a pioneering study, address the transaction costs related to farmland and report the conditions necessary for collective cultivation of rice farming in Japan. Arimoto and Nakajima (2010) focus on the institutional barriers to farmland consolidation, including legal barriers, compensation for tenants’ investments, transaction costs, and the high potential for farmland conversion. Through an econometric analysis using prefectural data, Takahashi and Honma (2015) demonstrate that farmland consolidation remains inhibited by various transaction costs related to farmland. The growing diversity of the stakeholders involved in farmland use complicates how public goods associated with the use of farmland should be provided. Previously, the composition of a rural society was simple, as the only actors were family farms, in which the providers and beneficiaries of public goods were identical. This composition has become more complex over time, during which there were a large number of non-farmers who used to be farmers with or without keeping their ownership rights over farmland as well as a smaller number of farmers. These rearrangements in the rural society complicate the relationship between the beneficiaries and the providers of economic and environmental features related to farmland. Given the high transaction costs related to consolidating farmland and the issues associated with providing public goods, it is necessary to use an institutional mechanism to achieve farmland consolidation. Recent developments in empirical institutional economics indicate that communities contribute to complementing market imperfections in addition to the government’s provision of public goods through formal legislation (Aoki and Hayami 2001). Hayami (2009) defines “social capital” as the structure of informal social relationships conducive to developing cooperation among economic actors aimed at increasing social product, which is expected to accrue to the group of people embedded in those social relationships. The community is the mechanism that guides community members to voluntary cooperation based on intensive social interactions. As compared to the market and the state, the comparative advantage of the community lies in the supply of local public goods. According to Hayami (2009), the local public goods commonly supplied by a community include the 1) provision of social safety nets, 2) conservation of the commons, and 3) reduction of transaction costs through the enforcement of contracts by means of corporation ostracism. Pretty (2003) argues that, when social capital is high in formalized groups, people have the confidence to invest in collective activities, knowing that others will as well. Previous studies also highlight the importance of collective action in the context of agricultural provision of agri-environmental public goods. OECD (2013) identifies the key factors for successful collective action that are categorized as follows: 1) resource system characteristics, 2) group characteristics, 3) institutional arrangements, and 4) external environment. When it comes to group characteristics, OECD (2013) argues that social capital (e.g. trust, networks, and supportive institutional arrangements) can help individuals work co-operatively. Strong social capital can lower the transaction costs of working together, facilitate the harmonization of interests among groups, and enhance the predictability of reactions among group members. There are many studies illustrating the conservation of common property resources by communities in Japan, such as common forests (Kijima et al. 2000; Shimada 2014), grazing land (Shimada 2015), irrigation systems (Sarker et al. 2015), and fishery resources (Platteau and Seki 2001). However, these arguments cannot be applied directly to the case of farmland consolidation, because the farmlands are private properties that provide agri-environmental public goods. This study focuses on how informal rules in communities can contribute to consolidating farmland, which in turn will lead to an increase in the productivity of both commodity and non-commodity outputs. Our argument is that the management rules exercised for common property resources by communities, such as promoting coordination and reducing transaction costs, also apply to coordinating farmland use in communities. While the past studies discuss the provision of agri-environmental public good and conservation of common property resources, we consider the efficient provision of both commodity and non-commodity outputs of farmland use and propose theoretical and empirical models to achieve farmland consolidation. The rest of this paper is organized as follows. In Section 2, we briefly explain the policy background of farmland consolidation. In Section 3, we propose a conceptual model to consider the conditions needed for successfully coordinating farmland use. In addition, we propose four models for coordinating land utilization and clarify the advantages and limits of community management. In Section 4, we conduct a case study on the special role played by a rural community in Shiga prefecture, where one of the four models in Section 3 played a strong role in drastically consolidating the farmland. In Section 5, we clarify the conditions for successful coordination by rural communities and their effects on the efficiency of farmland use based on quantitative analysis. In Section 6, we discuss the appropriate relationship between formal and informal institutions. Section 7 provides the conclusion. Land reform, which was implemented in Japan in 1947, constitutes an important precondition for the modern institutional framework of farmland use. After the Second World War, the government purchased farmland from landowners and transferred ownership rights to former tenants. Such land amounted to about 80% of the land under tenancy before the land reform. Although the land reform resulted in a considerable change in the distribution of land ownership, there were no basic changes in the size distribution of operational holdings. As a result, the traditional agrarian structure of Japan, characterized by small-scale family farms with an average size of about l ha persisted until recently. The Agricultural Land Law was enacted in 1952 to secure the results of the land reform. It imposed strict restrictions on the ownership of arable land and protected the rights of small landholders. As the industrial sector experienced drastic growth, increasing productivity in the agricultural sector was required for farmers’ income to compete with that in the other sectors. However, as the price of agricultural land exceeded the present value of agricultural income streams mainly due to the strong demand for transforming farmland for other uses, it became unprofitable for farmers to enlarge their farms through land purchases. The only alternative for expanding farm scale was land leasing. To activate a land rental market, the Agricultural Land Law was amended in 1970 to facilitate leasing transactions. The farmland system was further reformed in 2009 to relax the restrictions on acquiring land-use rights through leasing and promote effective land use. In addition to these reforms mainly focusing on the ownership and use rights of farmland, the need for a strong institutional framework for concentrating farmland among large-scale farmers was recognized. As such, public organizations, called landholding corporations, were established in 1970. These corporations were expected to buy or rent farmland from retiring farmers and sell or lease the land to those who would like to expand their farm size. However, as expected, small-scale farmers, most of whom were part-time farmers, did not leave farming, and as the resources granted by the government were limited;4 land concentration among large-scale farmers was not widely observed. The policy direction toward relying on these types of intermediate organizations has not changed fundamentally. An exceptional policy departing from this trend was the Farmers and Farmland Plan. The Democratic Party of Japan administration introduced this plan in 2012 to specify how farmland can be consolidated for principal farms and developed for community farming. The implementation of the plan requires collective action by rural communities, as it was devised after thorough discussions and periodical reviews among local and regional farmers. If the plan were adopted by local governments, farmers and communities can receive subsidies, such as long-term funding for principal farmers. Thus, the Farmers and Farmland Plan entrusts the coordination of farmland use to rural communities. By contrast, the current policy of the Liberal Democratic Party seems to have combined the Farmers and Farmland Plan and the traditional policy concept based on intermediate organizations. The policy focuses on new public organizations, known as “farmland intermediary management institutions,” which were established in 2014. These entities have replaced the former landholding corporations with the aim to consolidate the current fragmented ownership of farmland through sub-leasing. When farmland is sub-leased via intermediary institutions, the landowner can receive payment from the government. Another policy tool that contributes to consolidating land is farmland improvement projects, such as maintaining and repairing irrigation and drainage channels or reshaping plots.5 Farmland improvement projects in Japan, which are conducted via procedures in the Land Improvement Law, require collective action among farmers, because it is necessary for more than two-thirds of the participants to agree to plot reallocation among farmers and determine who bears the cost. The government and prefectures partly fund the cost of farmland improvement projects and levy the remainder from beneficiaries in districts undergoing land improvement. The subsidy for the projects increases when land is consolidated as a part of land improvement. To identify the necessary conditions for consolidating farmland, we examine whether the farmers in a rural community act collectively or individually in managing their own farmland. “Individual land use” refers to situations in which a landowner cultivates his or her land individually or leases it without any coordination with other landowners. “Collective land use” refers to situations in which a landowner joins community farming6 or leases his or her land through coordination with other landowners to consolidate land. We assume that the initial condition is individual land use by farmers. In addition, we assume, for simplicity, the benefit structure of land use is uniform among community members. We assume that farmers in the initial condition receive profit b from individual land use. If they decide to conduct collective land use, their profits are equal to the profit from collective land use a minus the transaction costs for collective land use c. The following paragraphs explain these parameters. The profit is a function of n participating farmers. If more farmers choose collective land use, it can result in increased productivity through economies of scale and elimination of farmland fragmentation. If some farmers quit cultivation and lease out their farmland to other members of the community with the intention of consolidating their leased land, they can benefit from collective land use through increased and stable rents. This will enable the efficient provision of public goods, such as managing water for irrigation and preserving the rural landscape. These effects result in increasing returns to scale for the participating farmers, and the effects increase with the number of farms. However, collective utilization can lower the capital value of the farmland, owing to the uncertainty of who is responsible for cultivation. The landowners may fear a decrease in the value of the farmland because of improper management and losing the chance to convert the farmland for non-agricultural uses if the cultivators refuse to return it. If farmers continue individual land use, they can retain property rights to the land or lend it to a person of their choice, thus enabling them to preserve their land assets independently. The profit from individual land use is an increasing function of the number of participants in collective land use, because individual farmers can partly benefit from the environmental externality of collective farmland utilization. These costs accrue from the collective utilization of land. They can be of two types: the cost of mobilizing farmland and the cost of collective action. The former refers to the costs associated with concentrating farmland into large-scale cultivators, such as costs for searching, negotiating, surveying, contracting and enforcing, while the latter refers to the costs associated with achieving collective land use. In addition, the collective use of farmland requires continuous collective action within the rural community for the reallocation of land rights and management of resources. These transaction costs depend on the form of collective land utilization. We can understand the abovementioned benefit structure through a multi-person game, in which the profit from collective land use has increasing returns to scale with respect to the participating farmers. For example, Runge (1986) and Baland and Platteau (1996, 1997) study this type of game theory situation. There are several scenarios under which individual community members may decide whether to manage their farmland collectively or individually. We employ the framework of the multi-person game proposed by Schelling (1978) and Runge (1986) to determine possible equilibria. Figure 1A–C depict the three possible cases. Three possible cases for collective land use. (A) Inefficient cooperation. (B) Multi-person prisoner’s dilemma. (C) Multi-person assurance problem. Case 1) Even if all other members of a village participate in the collective utilization of farmland, the profit from collective use is less than that from individual use. In this case, collective use is not an option for these members, because it is strongly dominated by individual use of farmland, regardless of the number of participants. Case 2) We analyze this case as the multi-person prisoner’s dilemma (MPD). When the number of community members choosing to participate in the collective utilization of farmland is greater than k, the payoff to the cooperating members becomes larger than the initial situation. However, individual land use is the dominant strategy for all members, because a farmer can benefit from free riding while other members cooperate. Therefore, the Nash equilibrium is that all members continue acting individually. Cooperation is possible even in the MPD with an enforcement rule imposed by an outside authority (Runge 1986). However, this is improbable if the formal institution protects farmland property rights, as is the Farmland Law in Japan. This is a variant of the “tragedy of the commons” proposed by Hardin (1968). Farmers will continue individual land use, despite knowing that they can benefit from switching to collective land use. Case 3) We can understand this kind of situation as a coordination or assurance game. Similar to Case 2, in which the number of community members choosing to cooperate is greater than k, the payoff of the cooperating members increases from the initial situation. The difference from Case 2 is that cooperation becomes the dominant strategy if the number of cooperating members is greater than y. Therefore, if a farmer does not participate in collective land use when only a few farmers do so, the farmer may choose to participate once the majority of members join. In a coordination game, the Nash equilibria are the initial situation (all farmers are involved in individual land use) and when all farmers switch to collective land use. The latter is more Pareto efficient than the former. However, the community may fail to switch to the more efficient equilibrium if it cannot coordinate with the shift from the initial condition. Which of the three possible cases apply to the actual situation depends on the value and curvature of a, b, and c. However, the current trends of farmland use in Japan, as well as the agricultural support policy, lead to the increased likelihood of Case 3. First, as demonstrated by Takahashi and Honma (2015), the increasing economies of scale in rice production make the a(n) curve sharper. There are also economies of scale in the provision of non-commodity outputs, as argued by Shobayashi et al. (2010). Second, due to the aging farming population, the profit from individual land use is decreasing, which reduces b(n). Third, Japan’s agricultural support policies, such as the Farming Income Stabilization Measures, provide intensive support for certified large-scale farming, making a(n) sharper. Fourth, land values in Japan have been decreasing because of the economic recession, which further decreases b(n). We should also note that the transaction costs of collective land use c depend on the formal and informal institutions for land use. For example, if intermediary institutions work effectively, they may lower transaction costs associated with mobilizing farmland, increasing the likelihood of Case 3. The role of Landholding Corporations in Japan, discussed in Ito et al. (2016), was a typical case of the public intermediary institution lowering transaction costs. Although the issues that we would like to address later in this paper are not those associated with common property resources, it should be emphasized that the management of common property resources indicates the profit structure of a coordination game in a number of cases. Baland and Platteau (1996) suggest that problems of the commons are not necessarily well depicted by the classic Prisoner’s Dilemma, and that co-ordination problems play a dominant role in many circumstances. White and Runge (1995) study voluntary collective action in Haiti, in which small watersheds are the common responsibility of a group of users, and brand the situation as an assurance game. Hodge and McNally (2000) study restoring wetland areas and argue that the problems of collective action can be overcome by an external agent to facilitate communication between farmers, provide information, and incur transaction costs. Marshall (2004) studies an Australian community-based program of natural resources governance as the assurance problem in providing large-group collective goods. Some researchers propose conditions that determine whether cooperation occurs in a coordination game. Baland and Platteau (1996) argue that rural communities can effectively sustain co-operation if an effective authority structure exists to provide the required leadership and sufficient trust is established to countenance optimistic expectations regarding others’ intended behavior. For example, if the rural community has strong leadership, the leader can induce cooperation by mobilizing a certain number of collaborators. In addition, if there is adequate communication within the community, awareness about the profit structure of other members prompts farmers to cooperate. We argue that another key factor for successful cooperation is the level of social capital accumulated in the community. Social capital contributes to coordination as it offers spaces for communication and reduces the transaction costs of collecting information. It also leads to coordination through sanctions and peer pressure against uncooperative members. Ostrom’s framework for self-organizing and self-governing common pool resources (Ostrom 1990) may also have significant relevance to the discussion in our paper. More specifically, many self-organizing common pool resources were identified, in which internal norms shared by community members and future opportunities associated with collective action could contribute to an institutional shift in the self-governing common pool resources. These factors would, in turn, result in reducing the extent of transaction costs. The theoretical consideration discussed in Section 3.1 suggests that it is important for farmland consolidation to mitigate the transaction cost for collective land use c and arrange conditions for coordinating interests among the members when the economic conditions of farmland consolidation are satisfied. We consider the institutions essential for consolidating farmland and classify the types of farmland consolidation into four simplified models. 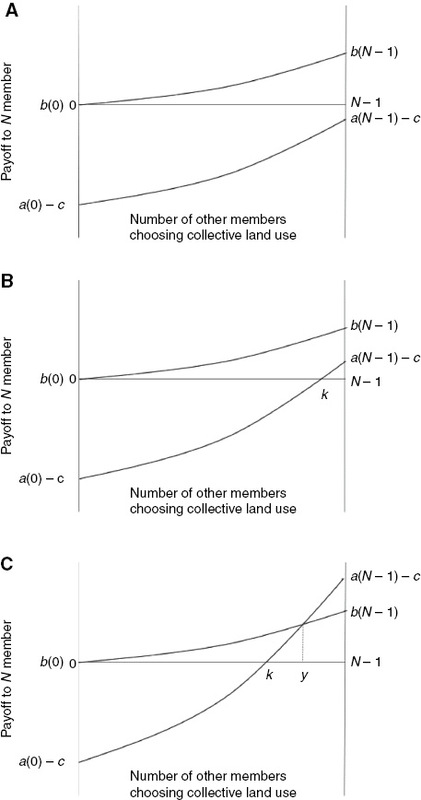 We compare the four models in terms of (1) change in profits from individual to collective farmland use for landowners and cultivators, (2) transaction costs for mobilizing farmland, (3) transaction costs associated with collective action, and (4) the possibility of coordinating the interests of community members. In the theoretical model, (1) relates to the change in profits resulting from a shift to collective land use (a–b), while (2) and (3) relates to the transaction costs for collective land use (c) and (4) relates to the coordination to switch to an efficient equilibrium. Here, landowners and cultivators make individual transactions for farmland consolidation. In this case, as the landowners can lend their farmland at will to cultivators, they receive land rent while attaining the capital value of their farmland. In this model, collective actions and coordination are not necessary. However, under individual transactions, the landowner and cultivator must bear the high transaction costs associated with mobilizing farmland, such as searching for proper and reliable counterparty. In addition, the cultivators must coordinate with other landowners and cultivators by themselves for resolving farmland fragmentation, as the rural community is not involved. Arimoto et al. (2016) indicate that individual transactions cannot accomplish sufficient consolidation because the occurrence of a “double-coincidence-of wants,” which is necessary for voluntary exchanges, is too rare. This model involves a system in which landowners entrust their land to an external public intermediary institution, which then sub-leases the consolidated farmland to principal farmers. The cultivators can receive greater profits from the scale economy if the consolidation can be achieved. The transaction costs associated with mobilizing farmland are lower than those of Model 1 because these costs are externalized to the public intermediary institution. However, Model 2 poses several problems: the relationship between the farmland owner and cultivator is vulnerable owing to the presence of a public intermediary institution, and the landowner may evade transferring the land rights, fearing the loss of capital value of the farmland. In particular, if landowners have already had bilateral contracts with cultivators, there will be little incentive for landowners to cancel individual contracts and sign new contracts with a public intermediary institution. Moreover, it is difficult for the intermediary institutions, especially those recently established, to coordinate the interests of the community members. Farmland consolidation can only proceed gradually because the public intermediary institutions collect farmland individually from the landowners. Here, the majority of farmers in a village form community farming units and practice collective cultivation. Generally, farmland can be consolidated entirely under community farming at once, while preserving cordial relations between landowners and cultivators. Thus, transaction costs for mobilizing farmland are small as there is no need for coordination between landowners. In addition, coordination by the rural village is maintained, as the members continue to be the utilizers of the farmland. However, there are transaction costs of collective cultivation, such as costs for forming and maintaining a community farming unit. Ishida and Kiminami (1987) indicates the “cost for consensus building” and “costs for maintaining the organization” for forming a community farming. Moreover, the profits to cultivators decrease under community farming owing to the moral hazard problem, that is, cultivators receive only part of the profits of their efforts. Nakajima and Tahara (2009) report that incentive problems due to team production can arise in community farming. Here, rural communities coordinate principal cultivators and the majority of landowners and work as intermediary institutions for farmland consolidation. Once this type of a community-based intermediary institution is established, coordination is relatively easier, as the interests of the members continue to be reflected in the rural community. As such, coordination by the rural community can result in rapid consolidation. As the landowners are members of the rural community, they can partially preserve their relationship with cultivators, reducing the concern regarding the capital value of their farmland. The biggest issue posed by Model 4 is the existence of the transaction costs associated with collective action to make the rural community work as an intermediary body. Another problem is that this model requires principal farmers with the capability of expanding farm size, which is not necessary in Model 3. A comparison of these four models indicates that the implementation of land consolidation under Model 1 is difficult, owing to the transaction costs associated with land mobilization. Land consolidation under Model 2 also requires a majority of the landowners to agree to lease their lands to a public intermediary institution. However, there is little incentive for landowners with bilateral contracts to entrust their farmland to a public intermediary institution. Therefore, Models 3 and 4 can achieve a higher degree of land consolidation than that under Models 1 and 2 if the problem of high transaction costs associated with collective action is resolved. The transaction costs associated with collective action are high in Models 3 and 4 because these models require formulating and maintaining informal institutions in the community (i.e. collective farming unit in Model 3 and community-based intermediary institutions in Model 4). Therefore, the level of social capital in the community for mitigating transaction costs through social interactions influences the successful conditions for Models 3 and 4. Shobayashi et al. (2011) argue that the key question here is whether the transaction costs associated with organizing farms are lower than the reduction in transaction costs. Among the above four models, Model 1 has never been a policy target in Japan. The Ministry of Agriculture, Forestry and Fisheries acknowledges that large-scale farmers are reluctant to increase their farm size mainly due to their geographically scattered plots resulting from bilateral contracts with a large number of small landowners. The current agricultural land policy in Japan is to encourage Model 2 in areas where large-scale farmers exist and Model 3 in areas where small-scale farmers are dominant. However, Model 2 has a limited capacity in consolidating lands as the majority of the landowners will not lease their lands to public intermediary institutions. According to the official statistics, the annual ratio of the sub-leased farmland by the public intermediary institutions to the policy target of farmland mobilization was 5% in 2014, 18% in 2015, and 13% in 2016. Hence, the government provides subsidies to landowners who agree to lease their land to a public intermediary institution, indicating the lack of incentives for landowners to form contracts with public intermediary institutions. On the other hand, Model 3 can contribute toward significant consolidation of lands. However, it is not realistic to expect a rapid increase in farmland through collective farming because of the high transaction costs of collective action and moral hazard problem, which has been supported by statistical figures. According to the agricultural census and the survey for community farming in 2015, only 14.3% of the total farmland in Japan and 18.0% of the farmland in the Non-Hokkaido region is committed to community farming. We should note that even these figures include community farming units that have been formed to receive subsidy without actual cultivation. Therefore, the main challenge of the land policy is the way of consolidating lands in areas where principal farmers have the potential to increase farm size and where Model 2 has been the policy target. Our argument that Model 2 has a limited capacity of consolidating farmland makes Model 4, which has not been a principal policy target in Japan, a suitable alternative model. We will discuss the potential role and successful conditions of Model 4 in the subsequent case studies and quantitative analysis. Model 4 can assume a wide range of forms, depending on how many community members in a village join an intermediary organization. Shobayashi and Okajima (2014) identified a promising case of Model 4, in which a majority of the community members join an intermediary institution. In this section, we present the details of this case to investigate the process of land consolidation and the conditions for successful collective action. We analyze the Shingai community in Hikone City, Shiga Prefecture as an example of farmland consolidation. The most distinctive geographic feature of Shiga Prefecture is Lake Biwa, the largest lake in Japan. Hikone City is located to the east of Lake Biwa, and the Shingai community is located on its shore. According to the Agricultural Census of 2010, the community consists of 273 households, of which 16 are unincorporated farmers. Of the 90 ha of farmland in the Shingai community, six individual farmers cultivate around 80 ha. However, their plots are highly fragmented. The land-use rights dispersed among these six individual cultivators have consolidated through discussions within the community. The management the areas of these cultivators (Figure 2) indicate that the achieved scale of consolidation is significant. The largest manager operates an area of around 30 hectares, which has been consolidated. Land consolidation in the Shingai community. Note: Each color represents different cultivators. Source: Shingai Association for Improving Farmland Utilization. The primary driver for this consolidation was an association established by around 130 landowners to improve farmland utilization, based on the territorial relationships within the community. The landowners established this association based on the Promotion of Agricultural Land Use Act, which coordinates farmland use. The association in the Shingai community has established a rule in which landowners do not object to anyone renting their land. This rule, along with the coordination among the six large-scale cultivators, has resulted in significant consolidation. Specifically, coordination among the cultivators can proceed smoothly, as the rule eliminated the constraints associated with landowners’ preferences for specific tenants. Then, the question is why the Shingai community was able to establish the landowners’ association. One reason is that the division between the use and ownership was largely complete, and there was no competition among the six cultivators for new farmland. In addition, these six cultivators are residents of the community and thus, they had lower concern regarding the transfer of land-use rights. Another important point is the role of informal institutions in the community. Prior to the establishment of the landowners’ association, the community relied solely on the neighborhood council. This council is engaged in local activities, such as organizing festivals and preserving the environment. This council is informal in that it does not have any legal support, and is based on historical convention. The Shingai community has a history spanning 700 years, and the neighborhood council has had a significant role in maintaining the community’s activities. Before establishing the landowners’ association, the cultivators rented land through individual transactions with landowners. When the farmland was offered after the owner retired from cultivation, there was competition among the cultivators, which disrupted the relationship among community members. Thus, to preempt such problems, the neighborhood council offered consultancy and cemented the process of distributing the farmland. A land improvement project to rehabilitate drainage channels was another factor in accelerating the consolidation. In Shingai, representatives of the neighborhood council, landowners, and cultivators primarily promoted land improvement. To receive increased subsidies for such projects, the community decided to form the association to improve farmland utilization and assume unconditional authority from the landowners. These experiences of the Shingai community indicate the importance of social capital within a rural community. In this case, the landowners’ association was founded upon an informal organization with a long history, the neighborhood council, but with a new role that the neighborhood council could not play, namely, the coordination of farmland use in the community. Whether the successful conditions for farmland consolidation are universal to other communities in Shiga prefecture is an open question. However, successful practices of public farmland intermediary institutions indicate the importance of community mechanisms. For example, the Ohnogi community in Maibara City succeeded in farmland consolidation with the help of public intermediary institutions.8 There were several individual cultivators, an incorporated cultivator, and community farming in the Ohnogi community, cultivating highly fragmented plots, with a long-cherished dream of farmland consolidation. After a number of meetings among the cultivators and landowners and with the strong leadership of the community leaders, the community finally coordinated the farmland for community farming. Subsequently, the community entrusted the farmland to the public intermediary institutions and consolidated the farmland. Other successful practices of public intermediary institutions in Shiga and other prefectures, documented by the Ministry of Agriculture, Forestry and Fisheries indicate the role of community mechanisms in coordinating landowners and principal cultivators. The theoretical consideration and case studies of farmland consolidation highlights the importance of social capital in mitigating transaction costs for collective actions and promoting coordination within the community. This section undertakes a quantitative analysis of data from Shiga Prefecture to validate the proposed model of land coordination. The geographical and economic conditions are similar among the rural communities in Shiga prefecture; for example, most of the rural communities are located around Biwa Lake, and depend on rice farming. Therefore, the economic conditions for farmland consolidation should be similar. By comparing the types of land use among the communities in Shiga, while controlling for the demographic and geographical variables, we can analyze the effect of social conditions on land use. This study used data collected by Shiga Prefecture administration during its Survey of Community Farming conducted in 280 rural communities in the prefecture, of which, 267 submitted their responses (response rate of 95%). The survey was conducted between October, 2013 and February, 2014 in the form of interviews with community representatives.9 The originality of the data is that they include ample information on the state of farmland use and community activities, which are not available in the national agricultural census. The two major variables explaining farmland use and its coordination are the level of social capital and experience in farmland improvement projects. We consider the experience in farmland improvement projects as a dummy variable. As discussed in section 2 and 4, the land improvement project offered a chance to coordinate for collective farmland use. As Arimoto (2011) notes, collective actions, such as plot exchanges, are necessary for implementing farmland improvement projects. Therefore, farmland improvement projects do not just improve the physical condition of the farmland, but also provide the community with the experience of joint participation in collective actions. Consequently, we interpreted experience in farmland improvement projects as a variable indicating both the physical state of the land and the community’s social capital. Furthermore, demographic conditions explain farmland use and its coordination. We consider the proportions of farming households in the community and the working-age farming population. We calculate the former variable as the ratio of farming to total households in the community, with data obtained from the Survey of Community Farming. This variable represents the relative number of farmers in the community. With data obtained from the Agricultural Census, the latter variable is the ratio of farming population under 65 years of age to total farming population. If the working-age farming population is higher, it is likely that the community has potential principal farmers and leaders who would coordinate members’ interests. Furthermore, we introduced control variables for the geographical conditions in the community to prevent omitted-variable bias.13 We obtained these data from the Agricultural Census. In addition, we included dummy variables for six administrative regions. Using the abovementioned explanatory variables, we analyzed the community coordination and state of farmland use in the community. Farmers and Farmland Plan, which takes a value of 1 if the community has devised the plan. Hitherto, we have argued that social capital in rural communities contributes to the effective utilization of farmland through such means as farm size expansion, not abandoning farmland, and reducing the transaction costs of collective action within the community.15 The effective utilization of farmland will also determine the outlook for the community’s future use of farmland. Takahashi and Honma (2015) demonstrate the association between community variables and the proportion of land under tenancy, but its mechanism remains unclear. Table 1 presents the descriptive statistics for the explained and explanatory variables. Descriptive statistics for the explained and explanatory variables. The descriptive statistics for geographical variables are not presented here. We conduct the analysis using ordinary least squares with heteroscedasticity-robust standard errors. When the explained variables take the binary values, the estimation model is a linear probability model. The regression analysis may not indicate the causal effect relations, but it indicates the association of social conditions with farmland use and its coordination, while controlling for demographic and geographical variables in the original data. We do not demonstrate the regression coefficients for the geographical variables. We set the significance level at 10% because of the limited sample size in the original data, despite the possibility of a Type I error. Tables 2 and 3 report the results of the estimation. Estimation results of the types of community coordination on farmland use. ***, **, and * indicate significance at the 1%, 5%, and 10% levels, respectively. Estimation results of the state of farmland use. The level of collective activities significantly affects coordination among individual cultivators. We do not observe the effects of other variables. Regarding community farming, the only significant variable is experience with farmland improvement projects. The level of collective activities has an insignificant effect. Both experience with farmland improvement projects and the level of collective activities positively affect the formation of the Farmland Plan. These results demonstrate the importance of social capital in rural communities in coordinating individual cultivators. Notably, the demographic variables do not affect these three types of farmland coordination. The share of large-scale cultivators (areas over 5 ha) increases when the level of collective activities is high and the community is experienced in farmland improvement projects. The level of collective activities, experience with farmland improvement projects, and share of working-age farming population significantly reduce the proportion of abandoned farmland and improve the outlook for community farming. These results indicate that accumulation of social capital in rural communities contribute to the efficient utilization of farmland. Overall, the estimation results verified our discussion that social capital in communities, proxied by the level of collective activities and the experience in farmland improvement projects, play an important role in collective land use and in turn, efficient land use. We proposed four models for farmland consolidation and compared their advantages through case studies and econometric analysis. Past studies on the provision of agri-environmental public goods and the conservation of common property resources, such as OECD (2013), point to the importance of social capital for promoting collective action. The findings of this paper are a generalization of past studies, in relation to the case of farmland consolidation, in which both private and public goods are provided. Through theoretical and empirical examination, we prove that the level of social capital is the key factor in coordinating farmland use. These findings confirm the role of social capital as being conducive to developing cooperation as discussed by Hayami (2009). We recognize that having an institutional framework that offers a variety of options and allows farmers to make their own choices is essential. The current policy of farmland consolidation in Japan places the largest emphasis on Model 2 and focuses solely on coordination by public intermediary institutions external to the community. However, if the level of social capital in a rural community is sufficient to induce collective actions, as in the case of the Shingai community, the policy should not substitute local communities, but allow voluntary coordination among individual cultivators. This argument, on the other hand, indicates that there is room for these institutions to play a large role when social capital is not preserved. In other words, we must rely on public intermediary institutions in areas where voluntary coordination cannot be expected. Agricultural policies should also pay sufficient attention to how public intermediary institutions and community-level institutions can complement each other. The government should introduce appropriate formal institutions to achieve farmland consolidation through community autonomy. Baland and Platteau (1996) argue that it is essential that the state provides a clear framework of basic rights, rules, and objectives to serve as a guideline for a voluntarist resource management policy. A typical example of the government’s role in farmland consolidation is farmland improvement projects. Such projects do not merely improve the physical condition of the land, but also provide the basis for subsequent land coordination. Farmland consolidation through the coordination of the community and the establishment of landowners’ associations, as observed in the Shingai community, holds significance for the social responsibility of landowners and cultivators. Farmland consolidation increases the efficiency for cultivators and rents for landowners, both of which can make cultivators and landowners economically better off. It is theoretically possible for landowners to give up a part of increased rents and instead, impose conditions on cultivators from the standpoint of long-term environmental sustainability. For example, a landowner association may require cultivators to reduce the use of chemical inputs or preserve biodiversity in return for leasing consolidated land to these cultivators. This type of consolidation through collective actions may lead to the establishment of a new normative consciousness for utilizing farmland as a local resource and the spontaneous emergence of rules for coordinating farmland use in Japan. This argument can have conceptual implications for the use of farmland as well as the management of local resources and public goods associated with agriculture, which differs from general arguments of common property resources. The experience in Shingai refers to a situation in which natural resources (i.e. farmland) that are individually owned by a large number of landowners are used by a relatively small number of large-scale resource users (i.e. cultivators), and provide local communities or even society with public goods (e.g. landscape preservation and flood prevention) through consolidated use of the resources. In this case, the resources in question are not common property resources, but private goods, wherein collective action that uses the resources in a consolidated way can supply public goods. What we should emphasize here is that the owners and users of the resources differ among each other, which distinguish this case from the other cases in which the management of common property resources is an issue for community members. The owners of resources can have opportunities to improve their overall welfare by establishing an institutional mechanism to influence the ways in which the users of the resources will manage the resources. In this context, it would also be interesting to examine whether and how the analytical framework proposed by Ostrom (1990) for self-governing common pool resources could be applied to our case, in which the resources in question are not common property resources. As the case of the Shingai community shows, we can see the establishment of the Shingai Association for Farmland Utilization as a case in which a new collective-choice rule was created. Our empirical analysis indicates that a strong relationship among community members would have affected individual decisions for supporting this institutional shift. Ostrom’s framework shows that individuals compare expected costs and benefits associated with the institutional shift, and that, in doing so, they are affected by internal norms, as well as how they “discount” future benefits. As Shobayashi and Okajima (2014) argue, and Ostrom’s framework indicated, landowners living in the Shingai Community would have low discount rates, which may have this institutional shift, based on the collective action by the landowners being more attractive to them in the long-run. The application of Ostrom’s framework can also support our argument above, to the effect that public intermediary institutions and community-level institutions should complement each other. As long as the possibility of sustaining or establishing self-governance can be expected, the framework suggests that the usefulness of direct policy intervention should be tested carefully. This principle can also be applied to our case. Examining the possibility of establishing a self-governing institution should come first, before any state governing structure is tried, especially in the case where internal norms and low discount rates can be expected. This study proposed an appropriate system for coordinating farmland use in Japan. We briefly explained the policy background of farmland consolidation and subsequently proposed a conceptual model to identify the conditions for successful coordination of farmland use. We proposed four models for coordinating farmland use and conducted a case study on a rural community. The findings revealed the possibilities of farmland consolidation through coordination among individual cultivators by establishing an informal institution within the community. Econometric analysis proved that the promotion of collective actions increases the likelihood of communities with a high level of social capital to coordinate farmland use, concentrate farmland in the hands of large-scale cultivators, and prevent the abandonment of farmland. In addition, we discussed the appropriate relationship between formal and informal institutions. Overall, the results of this study point to the importance of social capital accumulation in rural communities to achieve high degrees of land consolidation. Further research is required to quantify the impact of farmland consolidation on improving the efficiency associated with the provision of non-commodity outputs such as flood prevention capacity and landscape and biodiversity preservation. It is also necessary to examine whether our discussion on farmland consolidation can be applied to other regions of Japan based on both the case studies and quantitative analysis using larger datasets and applied to other countries, especially Asian countries, where rice farming is dominant. More in-depth theoretical analysis is also required to examine the possibility of applying the Ostrom’s framework for common pool resources to the case where collective action is needed to increase outputs from private resources. 1Farmland concentration implies concentration of farmland into large-scale farms, while farmland consolidation refers to farmland concentration and resolution of farmland fragmentation. 2The OECD’s work on multifunctionality (OECD 2000) refers to multifunctional outputs as “non-commodity outputs” and discusses in detail when policy intervention for agricultural production could be justified to maintain the provision of these outputs. 3For a review of farmland policies in Japan, see Hayami (1988), Takahashi and Honma (2015), and Ito et al. (2016). 4Ito et al. (2016) demonstrate that landholding corporations served an intermediary role in facilitating the exchange of land-use rights. 5See Arimoto (2011) for the impact of farmland improvement projects on structural adjustment and farmland use. 6Community farming is a type of farming in which farmers of a community share fixed capital (i.e. machinery and land) and labor. 7The discussion here is partly based on Shobayashi and Okajima (2014). 8The information is sourced from the website of Maibara city (http://www.city.maibara.lg.jp/0000009081.html). In addition, we interviewed city administration staff on the farmland consolidation in the Ohnogi community. 9It is important to bear in mind that public farmland intermediary institutions had not yet been established at the time these interviews were conducted. 10Certain data of the community interviews for the Survey of Community Farming do not match those of the Agricultural Census. We proxied such data using average values for the administrative district in which that community was located. 11The Appendix presents the list of these activities. 12It should be noted that the relationship between the social capital and these collective activities is not necessarily clear. Another proxy variable used in the literature is the number of local meetings in the community surveyed in the agricultural census (for example, Takahashi and Honma 2015). The two proxy variables have statistically significant positive relationship (p value = 0.023). We used the data on collective activities because they are relevant to the level of cooperation in the community. Further research is required to determine how to measure the level of social capital in the rural community. 13The Appendix lists these geographical variables. 14We do not consider community farming units with the only aim of sharing farm machineries among the community members. 15Unfortunately, we could not obtain data on the level of farmland fragmentation. We would like to express sincere gratitude to Mr. Hideki Noda, a farmer in Shingai Village, Hikone City, Japan, for having kindly provided us with information about the activities of Shingai. Without his help and intellectual input over the last 5 years, the research would not have been completed. We thank Mr. Makoto Morino, of the Shiga Prefecture Government in Japan for sharing his knowledge and experiences about farmland consolidation policies and for providing us with the data we used in Section 5 of this paper. We also thank the editors and the reviewers for their helpful comments and suggestions. This work was supported by JSPS KAKENHI Grant Number JP16K18762 and 17H03882. Arimoto, Y (2011). The Impact of Farmland Readjustment and Consolidation on Structural Adjustment: The Case of Niigata, Japan. CEI Working Paper Series No. 2011-3.Center for Economic Institutions, Institute of Economic Research, Hitotsubashi University. Arimoto, Y and Nakajima, S (2010). Review of Liquidization and Concentration of Farmland in Japan. Journal of Rural Economics 82(1): 23–35. http://doi.org/10.11472/nokei.82.23. Aoki, M and Hayami, Y (2001). Communities and Markets in Economic Development. United Kingdom: Oxford University Press. Arimoto, Y, Nakajima, S and Tomita, K (2016). Farmland Consolidation by Plot Exchange: A Simulation-based Approach. The Japanese Journal of Rural Economics 18: 1–16. http://doi.org/10.18480/jjre.18.1. Baland, J. M and Platteau, J. P (1996). Halting Degradation of Natural Resources: Is There a Role for Rural Communities?. Rome, Italy: Food and Agriculture Organization. Baland, J. M and Platteau, J. P (1997). Coordination Problems in Local-level Resource Management. Journal of Development Economics 53: 197–210. https://doi.org/10.1016/S0304-3878(97)00008-4. Davis, B, Blackstock, K, Brown, K and Shannon, P (2004). Challenges in Creating Local Agri-environmental Cooperation Action amongst Farmers and Other Stakeholders. United Kingdom: The Macaulay Institute. Hardin, G (1968). The Tragedy of the Commons. Science 162(3859): 1243–1248. https://doi.org/10.1126/science.162.3859.1243. Hayami, Y (1988). Japanese Agriculture under Siege. United Kingdom: Macmillan. Hayami, Y (2009). Social Capital, Human Capital and the Community Mechanism: Toward a Conceptual Framework for Economists. Journal of Development Studies 45: 96–123. https://doi.org/10.1080/00220380802468595. Hayami, Y and Kawagoe, T (1989). Farm Mechanization, Scale Economies and Polarization: The Japanese Experience. Journal of Development Economics 31(2): 221–239. https://doi.org/10.1016/0304-3878(89)90013-8. Hodge, I (2001). Beyond Agri-environmental Policy: Towards an Alternative Model of Rural Environmental Governance. Land Use Policy 18(2): 99–111. https://doi.org/10.1016/S0264-8377(01)00002-3. Hodge, I and McNally, S (2000). Wetland Restoration, Collective Action and the Role of Water Management Institutions. Ecological Economics 35(1): 107–118. https://doi.org/10.1016/S0921-8009(00)00171-3. Ishida, M and Kiminami, A (1987). The Development of Organizations and Markets in Rice Production. Journal of Rural Economics 59: 217–232. in Japanese. Ito, J, Nishikori, M, Toyoshi, M and Feuer, H. N (2016). The Contribution of Land Exchange Institutions and Markets in Countering Farmland Abandonment in Japan. Land Use Policy 57: 582–593. https://doi.org/10.1016/j.landusepol.2016.06.020. Kawasaki, K (2010). The Costs and Benefits of Land Fragmentation of Rice Farms in Japan. Australian Journal of Agricultural and Resource Economics 54(4): 509–526. https://doi.org/10.1111/j.1467-8489.2010.00509.x. Kijima, Y, Sakurai, T and Otsuka, K (2000). Iriaichi: Collective versus Individualized Management of Community Forests in Postwar Japan. Economic Development and Cultural Change 48(4): 867–886. https://doi.org/10.1086/452481. Latacz-Lohmann, U (1998). Moral Hazard in Agri-environmental Schemes, Paper presented at the annual conference of the Agricultural Economics Society, Reading, United Kingdom, March 25–28. Marshall, G. R (2004). Farmers Cooperating in the Commons? A Study of Collective Action in Salinity Management. Ecological Economics 51(3–4): 271–286. https://doi.org/10.1016/j.ecolecon.2004.06.016. Matsushita, K (2009). The Effect of Social Capital for the Conservation Policy of the Land, Water and Environment. Journal of Rural Economics 80: 185–196. http://doi.org/10.11472/nokei.80.185. Nakajima, S and Tahara, K (2009). The Choice of Participation Forms in Community-based Group Farming and Efficiency in Team Production, Paper presented at the International Association of Agricultural Economists Conference, Beijing, China, August 16–22. OECD. Multifunctionality: Towards an Analytical Framework. Paris: OECD Publishing. OECD. Providing Agri-environmental Public Goods through Collective Action. Paris: OECD Publishing. http://doi.org/10.1787/9789264197213-en. Ostrom, E (1990). Governing the Commons: The evolution of institutions for collective action. United Kingdom: Cambridge University Press, 1990. Otsuka, K (2013). Food Insecurity, Income Inequality, and the Changing Comparative Advantage in World Agriculture. Agricultural Economics 44: 7–18. http://doi.org/10.1111/agec.12046. Platteau, J. P and Seki, E (2001). Aoki, M and Hayami, Y eds. Community Arrangements to Overcome Market Failures: Pooling Groups in Japanese Fisheries. Communities and Markets in Economic Development. United Kingdom: Oxford University Press, 2001, pp. 344–402. Pretty, J (2003). Social Capital and the Collective Management of Resources. Science 302(5652): 1912–1914. http://doi.org/10.1126/science.1090847. Runge, C. F (1986). Common Property and Collective Action in Economic Development. World Development 14(5): 623–635. https://doi.org/10.1016/0305-750X(86)90128-2. Sarker, A, Ikeda, T, Abe, T and Inoue, K (2015). Design Principles for Managing Coastal Fisheries Commons in Present-day Japan. Ecological Economics 117: 32–38. https://doi.org/10.1016/j.ecolecon.2015.06.019. Schelling, T. C (1978). Micromotives and Macrobehavior. New York: W.W. Norton & Company. Shimada, D (2014). External Impacts on Traditional Commons and Present-day Changes: A Case Study of Iriai Forests in Yamaguni District, Kyoto, Japan. International Journal of the Commons 8(1): 207–235. http://doi.org/10.18352/ijc.348. Shimada, D (2015). Multi-level Natural Resources Governance Based on Local Community: A Case Study on Semi-Natural Grassland in Tarōji, Nara, Japan. International Journal of the Commons 9(2): 486–509. http://doi.org/10.18352/ijc.510. Shobayashi, M and Okajima, M (2014). A New Institutional Framework Related to Coordinating Land Uses for Developing Rural Villages.. Water, Land and Environmental Engineering 82: 715–719. in Japanese. Shobayashi, M, Kinoshita, Y and Takeda, M (2010). Issues and Options Relating to Sustainable Management of Irrigation Water in Japan: A Conceptual Discussion. Journal of Water Resources Development 26: 351–364. http://dx.doi.org/10.1080/07900627.2010.492609. Shobayashi, M, Kinoshita, Y and Takeda, M (2011). Promoting Collective Actions in Implementing Agri-environmental Policies: A Conceptual Discussion, Paper presented at the OECD Workshop on the Evaluation of Agri-environmental Policies, Braunschweig, Germany, June 20–22. Takahashi, D and Honma, M (2015). A Reexamination of the Agricultural Adjustment Problem in Japan, Paper presented at the 2015 Conference of the International Association of Agricultural Economists, Milan, Italy, August 9–14. White, T. A and Runge, C. F (1995). The Emergence and Evolution of Collective Action: Lessons from Watershed Management in Haiti. World Development 23(10): 1683–1698. https://doi.org/10.1016/0305-750X(95)00076-O. Proportion of paddy-filled area to the total farmland area.